The Center for Advanced Manufacturing Puget Sound (CAMPS) is an association of manufacturers, supply chain partners, professional service providers and affiliates (government, education, and non-profit organizations). These organizations all share common goals to: drive innovation, provide supply chain development, and collectively find 21st century workforce solutions. This partnership allows these companies to learn from each other, become interactive friends, and find new ways to help manufacturers grow stronger while accessing new products, processes, and technologies. 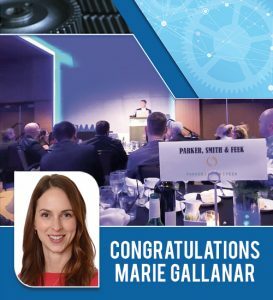 This week, CAMPS hosted their annual Recognition and Awards Banquet at the Meydenbauer Center, where manufacturers throughout the industry and Puget Sound region have an opportunity to get together to honor individuals and companies who have made innovative contributions. This year, Parker, Smith, & Feek’s Marie Gallanar, Account Executive, was appointed to the CAMPS Board of Directors! She has served in multiple capacities within the organization over the past two years and is looking forward to taking on this new role.